The University of Public Administration, Police and Justice in Güstrow, Germany was planning to renew the AV in the building constructed in the 1950s. Until now, they have been using portable projectors and mobile projection screens that had to be set-up for presentations, events and parties. Due to steadily growing demands on the building, a new technical overall concept was developed in cooperation with Wedow as several buildings were being renovated. The goal was to be able to serve various types of events through a modern AV system. An additional wish was to have the option on the weekends for a movie theater for the police recruits. The main stage area offered the possibility for Wedow to propose a concept with rear-projection. Andreas Luebke, responsible project manager at Wedow, could present a solution quickly and arrange an on-site demonstration. The projection screen requirements included 4K capability to be able to handle long-term needs. It also needed to be perfectly flat, retractable and 730 cm wide without seams. Since the current maximum width for a tensioned screen is 600 cm, it was clear that Luebke would need something special. 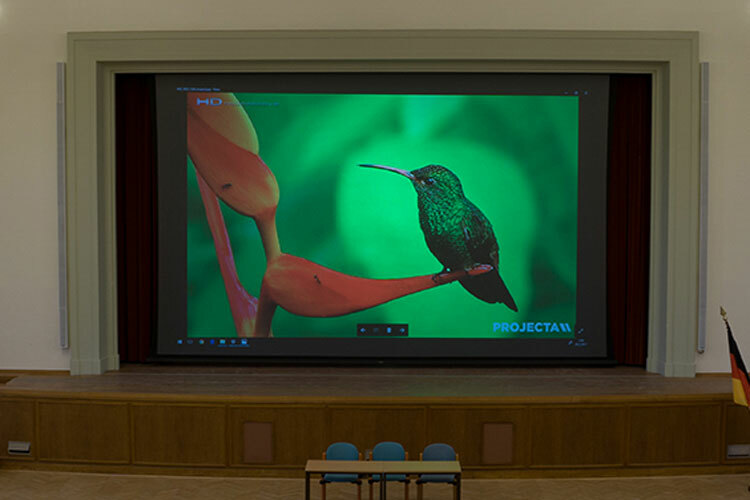 Da-Lite, a specialist in custom solutions, took on this challenge to create a tab-tensioned motorized projection screen over 700 cm wide. The challenge was to maintain the lateral tension on this large size. Since the project required a rear projection surface, the margin of error was even smaller. Imperfections on high resolution rear projection surfaces are much more noticeable. In the end, Da-Lite was able to build a custom Tensioned Professional 730 cm wide with a tensioned and perfectly flat rear projection surface. On the projection side, the NEC PH 1202 HL WUXGA projector was chosen with the NP-9LS12ZM1 lens. The delivery and unloading of the big screen was certainly a new experience and was also the biggest challenge, says Andreas Luebke from Wedow. The team from Wedow completed the installation professionally with a sharp, uniform and colorful projected image as a result.